Garry Oak meadow and invading yellow Scotch Broom. Robert Cannings. Most people would be surprised, if not shocked, to discover how many of British Columbia's wild species of plants and animals have arrived with humans from Europe and Asia. 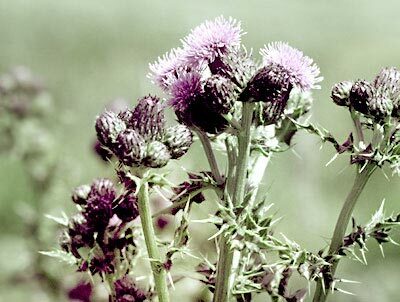 Canada Thistle: a rampant, prickly, introduced weed common in urban and suburban sites. RBCM. More than 500 species of plants – about one-fifth of the provincial total – have been either accidentally or purposefully introduced by humans! Most of these species are first established in areas where the native plants have been removed or disturbed – areas that have been ploughed, bulldozed or overgrazed, for example – and most of them stay there. 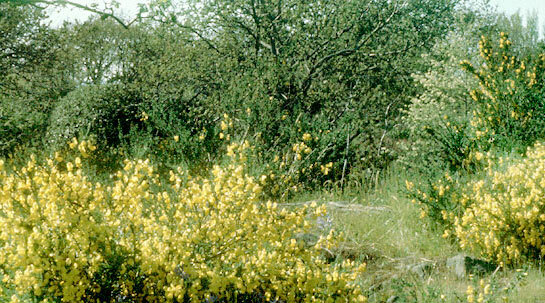 But some, such as Scotch Broom on the south coast and Purple Loosestrife in wetlands in the province's southern valleys, are successful invaders that can completely choke out the plant community that existed before their arrival.